Post: Gaurav Akrani. Date: 5/28/2010. No Comments. Label: Education, Management, Study Notes. Marketing is an important socio-economic activity with history of many centuries. It is an essential activity for the satisfaction of human wants and for also raising social welfare. Production is the base of marketing. It supplements production activities by distributing goods and services. Marketing links producers and consumers together for mutual benefits. It facilitates transfer of ownership of goods and services to consumers. Production will be meaningless if goods produced are not supplied to consumers through appropriate marketing mechanism. Marketing activities are conducted through the medium of money. They are conducted regularly throughout the world. Modern marketing is global in character. Everyone participates in marketing activities for the satisfaction of needs / wants. Customer is the most important person in the whole marketing process. He is the cause and purpose of all marketing activities. According to Prof. Drucker, the first function of marketing is to create a customer or market. All marketing activities are for meeting the needs of customers and for raising social welfare. Marketing itself is a "need-satisfying process". It facilitates physical distribution and creates four types of utilities viz., Form Place, Time and Possession. The term marketing can be given narrow or broad interpretation. In the narrow sense, marketing is concerned with the flow of goods and services from producers to consumers / users. This interpretation is 'product-orientation' of marketing. In the broader sense, marketing essentially represents consumer-oriented activity. It is for meeting the needs of consumers and naturally production and marketing activities are to be planned as per the needs and expectations of consumers. Marketing is for demand creation and demand satisfaction. This interpretation of marketing is now accepted. The broader interpretation views marketing as a "Total Concept". According to Philip Kotler, "Marketing is human activity directed at satisfying needs and wants through exchange process." According to J.F. Pyle, "Marketing is that phase of business activity through which human wants are satisfied by the exchange of goods and services." According to William Stanton, "Marketing is a total system of business activities designed to plan, price, promote and distribute want-satisfying products to target markets to achieve organizational objectives." This definition treats marketing as one managerial function. It also suggests consumer orientation to marketing concept. Marketing is a regular and continuous activity: Marketing is a continuous activity in which goods and services are manufactured and distributed to consumers. Assembling, grading, packaging, transportation, warehousing, etc. are supplementary to marketing and are useful for smooth and orderly conduct of marketing operations. Facilitates satisfaction of human wants: Marketing activities are basically for satisfying the needs of consumers and also for raising social welfare. Identification of consumer needs should be the starting point of marketing activity. Relates to goods and services: Marketing relates to goods and services. It is concerned with the exchange of goods and services with the medium of money. Trade transactions are between sellers and buyers of goods. Thus, goods and services constitute the basic and the most lively element in marketing. Brings transfer of ownership: Marketing activity brings transfer of ownership of goods and services and facilitates physical distribution. Production acts as a base of marketing. Creates utility: Marketing activity creates utilities (time, place and possession) through which human wants are satisfied. Wider socioeconomic significance: Marketing activity has wider socioeconomic significance as it facilitates large-scale production, creates massive employment opportunities, and promotes social welfare and cultural exchanges. Importance of 4 Ps: Marketing is the sum total of 4Ps. These are: product, price, promotion and physical distribution. Large-scale marketing is possible through appropriate combination of 4Ps called marketing mix. Integral part of business: Marketing is one aspect of business. It is within the scope of business and is also linked with other functional areas of business. Evolutionary concept: The concept of marketing has undergone significant changes. It is not merely for profit maximization. It has wider social significance. Precedes and follows production: Production and marketing are closely related activities. Goods are produced for marketing. Here, marketing follows production. In addition, marketing suggests what consumer wants and production is adjusted accordingly. Here, production follows marketing. Wide in scope: The concept of marketing is wide/comprehensive. It is not concerned merely with selling of goods but with other functional areas of business such as production, finance and personnel. Satisfies Human Wants: Marketing plays an important role in the satisfaction of human wants by maintaining regular supply of goods to consumers. It provides better life and welfare to people by satisfying their wants and also by providing useful goods and services which can make their life happy and enjoyable. Provides profit and goodwill to marketing enterprises: Marketing is important to marketing firms as they earn profit by conducting marketing activities. Marketing enables a firm to expand business activities for market reputation and goodwill. The firm can achieve its objectives through successful conduct of marketing activities. Even new product can be introduced for consumer satisfaction and sales promotion. Facilitates specialization and division of labour: Marketing function, if performed successfully, leads to specialization, division of labour and efficient performance of production function climaxing in economic stability. Widens markets: Marketing facilitates widening of markets through large scale movement of goods throughout the country. Even advertising and sales promotion techniques are useful for widening markets. They provide convenience to consumers and profit to traders. Improves the standard of living of the society: Continuous production improves the skill of the workers. In addition, marketing process provides new varieties of quality goods to customers. It facilitates production as per the needs of consumers and supplies such production to consumers. This raises the standard of living of the people. It is the marketing which has converted "Yesterday's luxuries into today's necessaries". Facilitates economic growth: Marketing brings industrial/economic growth. It facilitates full utilisation of available natural resources. Marketing creates new demand for goods and thereby encourages production activities. This leads to the creation of massive employment opportunities. Thus, marketing is the kingpin that sets revolving of the whole economy. Creates new norms of socioeconomic behavior: Marketing develops new ways of life in the society. It makes the society progressive and dynamic. National economic policy is successfully implemented through marketing. It not only expands the home market but tries to establish a sound base for exports. Provides channels of communication to marketing firms: The marketing firms receive continuous feedback about demand for products and services through marketing. The three elements of marketing, namely, concentration, equalization and dispersion with their sub processes such as buying, assembling, transport, storage, standardization, grading, insurance, etc., facilitate quick communication between traders and consumers. Marketing is beneficial to producers and consumers. They get goods as per their needs and manufacturers get more profit and consumer support. Facilitates price control: Marketing facilitates price control by the manufacturers. It brings proper balance between demand and supply and this ensures price stability. Facilitates stability to marketing firm: Marketing is one major revenue generating source of a firm. It raises the turnover and profit of a business unit. A firm's survival, growth and stability are dependent on its ability to market the products efficiently. Marketing is thus one challenging function of management. Brings success in business: Marketing is a major activity of every business enterprise. If the marketing is not efficient, there will be losses and the whole firm will come in danger. This suggests that marketing is a risky activity with equal chances of getting profit and incurring losses. It is the successful marketing which supports all other activities of a business unit. 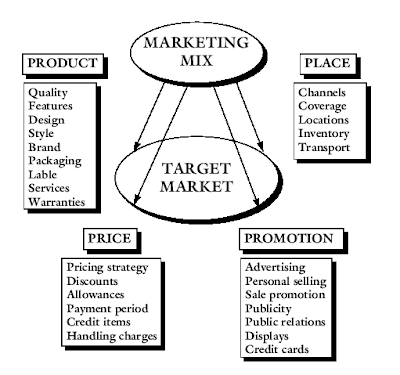 Marketing mix is the combination of four basic elements/ingredients under one head. Product itself is the most important element of marketing mix. Price, place and promotion are the other supporting elements. 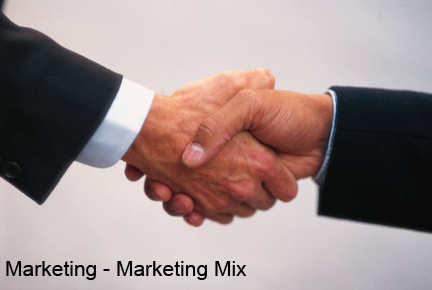 Marketing mix indicates an appropriate combination of four Ps for achieving marketing objectives. James Culliton, the American marketing expert, coined the expression Marketing Mix and described the marketing manager as 'mixer of ingredients" as he has to establish fair balance among the four elements of marketing mix in order to achieve marketing targets. He is also a 'decider', 'artist' of marketing mix formula. The four components of marketing mix are also called "marketing mix variables" or "controllable variables" as they emanate from within the enterprise and the marketing manager can use them freely as per his desire or need of the situation. The elements of marketing mix constitute the core of marketing system of a firm. It is a profitable formula for successful marketing operations. A marketing manager executes his marketing strategies through these instruments. The diagram given suggests the nature of marketing mix. According to W. J. Stanton, "Marketing mix is the term used to describe the combination of the four inputs which constitute the core of a company's marketing system: the product, the price structure, the promotional activities, and the distribution system." According to Philip Kotler, "A Marketing mix is the mixture of controllable marketing variables that the firm uses to pursue the sought level of sales in the target market." Combination of four marketing variables: Marketing mix is a combination/integration of four basic marketing variables namely, product, price, promotion and place. These variables are interdependent. Useful for achieving marketing targets: Marketing mix aims at achieving marketing targets in terms of sales, profit and consumer satisfaction. It is rightly said that marketing mix is the marketing manager's instrument for attainment of marketing objectives/targets. Flexible and dynamic concept: Marketing mix is not a rigid combination of four variables. It is in fact a flexible combination of variables. It is necessary to adjust the variables in the mix from time to time as per the changes in the marketing environment. It is the continuous monitoring of the marketing mix which facilitates appropriate changes in the mix. Periodical adjacent of variables necessary: Marketing mix variables are interrelated and need suitable adjustments from time to time. Updating of marketing mix is essential for making it a powerful tool for achieving marketing targets. Updating is also essential due to environmental changes taking place within the firm. Marketing manager acts as a mixer of ingredients: A marketing manager has to function as a mixer of marketing ingredients and has to achieve desired results through skillful combination of four Ps. He needs maturity, imagination and intelligence for appropriate blending of the variables. Customer is the focus point: The main focus of marketing mix is the customer. His satisfaction and support are important. Variables of marketing mix are for giving more satisfaction and pleasure to consumers. Variables are interrelated: Marketing mix variables are interrelated. Decisions in one area affect action in the other areas. An integrated approach is needed while making changes in the marketing mix variables. Consumer-oriented activity: Marketing mix is a consumer-oriented activity as its purpose is to give satisfaction and pleasure to consumers. Here, the needs and expectations of consumers are given special attention and 4 Ps are adjusted accordingly. Four Ps of sellers correspond to four Cs of customers: Four Ps in the marketing mix represent the sellers' view of the marketing tools available for influencing buyers. Each tool is designed to deliver a customer benefit. 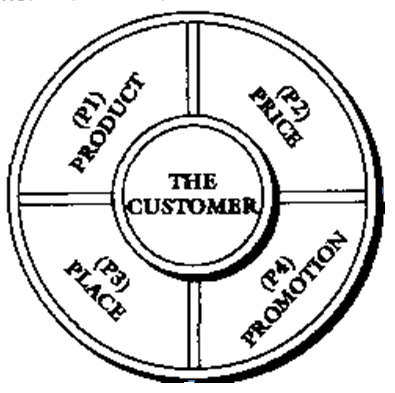 The sellers' four Ps correspond to the customers' four Cs as shown above. Product: Product is the article which a manufacturer desires to sell in the open market. It is the first element in the marketing mix. The product mix includes the following variables. Managing product component involves product planning and development. Here, the decisions are required to be taken regarding product range, branding, packaging, labeling and other features of the product. The product manufactured for market should be as per the needs and expectations of consumers. Product is the most powerful competing instrument in the hands of the marketing manager. It is the heart of whole marketing mix. If the product is not sound /attractive to the customers, no amount of sales promotion, appropriate channel selection or price reduction will help to achieve the marketing target. Hence, durability, quality, uses, etc. of the product are important from the marketing point of view. Various Aspects of Product Decisions in Marketing: In the marketing process, various decisions regarding the product are required to be taken. Marketing will be easy and quick if the decisions taken on various aspects of a product are appropriate. AU such decisions need to be taken by the marketing division of the Organisation. Such decisions should be based on current marketing environment, nature of market competition, consumer expectations, information available through marketing research and so on. Cooperation of other departments is also necessary in marketing decision-making. Production or product is rightly treated as the heart of the marketing mix. Customers purchase a product because of its attributes, features and benefits. These are the selling points of a product. They should be adjusted to the buying motives of consumers. A consumer/customer considers the total package of benefits available from the product and takes a decision to purchase the product. This suggests that various decisions regarding the product to be marketed need to be taken correctly. As a result, the product offered in the market will be a quality product. In addition, it will be utility oriented, attractive, convenient, property designed and branded. Even attractive packaging decision facilitates sales promotion. The following aspects of a product need careful attention in marketing decision-making. Branding and trade mark given to a product. Product servicing and channel of distribution. Guarantees and warranties of the product. Special features of the product from the marketing point of view. Decisions on these aspects of a product are important as marketing is directly related to these aspects. Sales promotion measures will be useful but their role will be supplementary/ supportive. Such measures may not be effective if the product to be marketed is not of standard quality or if the brand or package is not attractive or if the product is not as per the requirements/expectations of consumers. This suggests that decisions relating to product are important /crucial in the marketing of a product. Distribution channel (Place): Physical distribution is the delivery of goods at the right time and at the right place to consumers. Physical distribution of product is possible through channels of distribution which are many and varied in character. Transportation, warehousing and inventory control for making the product available to consumers easily and economically. For large-scale distribution, the services of wholesalers, retailers and other marketing intermediaries are required. A marketing manager has to select a channel which is convenient, economical and suitable for the distribution of a specific product. For instance, large numbers of outlets are required for the distribution of products of mass consumption such as soaps and oils. On the other hand, for the marketing of speciality products like refrigerators and TV sets, selective distribution through authorized dealers is quite convenient. Promotion: Promotion is the persuasive communication about the product offered by the manufacturer to the prospect. Display of goods for sales promotion. Promotional activities are necessary for large scale marketing and also for facing market competition effectively. Such activities are varied in nature and are useful for establishing reasonably good rapport with the consumers. Advertising gives information and guidance to consumers. Brand names are made popular through advertising. Along with advertising, personal selling is also useful for motivating the customers to buy a specific product. In addition to advertising and personal selling, a manufacturer has to use other sales promotion techniques at the consumer level and at the dealer level. The techniques at consumer level include displays, exhibitions, discount coupons, small gifts and free samples, attractive container and consumer contests. Consumer psychology is favorable for extensive use of such sales promotion techniques. After-sales services are also useful for promoting sales of durable good. Price: Price is one more critical component of marketing mix. It is the valuation of the product mentioned by the seller on the product. Pricing strategy selected and used. Pricing has an important bearing on the competitive position of a product. The marketing manager may use pricing as a tool for achieving the targeted market share or sales volume. Pricing can also be used for capturing market and also for facing market competition effectively. Pricing decisions and policies have direct influence on the sales volume and profits of the firm. Market price of a product also needs periodical review and adjustments. The price charged should be high enough to give adequate profit to the company but low enough to motivate consumers to purchase product. It should also be suitable to face market competition effectively. Basic elements of marketing mix is shown in below point number 9 on this page.